Characterized by frequent episodes of excessive overeating that bring about feelings of distress and shame4, binge eating disorder is a public health concern. A 2013 Harvard Medical School study in the journal Biological Psychiatry conducted a survey with respondents from 14 different countries to determine the prevalence of binge eating disorder. They found that binge eating disorder was more common than bulimia nervosa, with a lifetime prevalence of 1.4 percent for binge eating disorder compared to .8 percent for bulimia nervosa1. Scientists and public health experts have conducted research on binge eating disorder to determine its characteristics and risk factors, to assess the medical and psychiatric conditions associated with it, and to uncover information regarding effective treatment options for this eating disorder. There are several differing characteristics among patients with a binge eating disorder. According to the study in Biological Psychiatry, binge eating disorder is more common among women, and on average, the condition develops between the late teenage years and the early twenties. A second study, published in a 2009 edition of the International Journal of Eating Disorders, confirmed these results, finding that women were more likely than men were to report binge eating2. The results of the research with binge eating disorder suggest that women are more susceptible than men are to this condition. There also seems to be a relationship between obesity and binge eating disorder. A 2007 study in the journal Comprehensive Psychiatry found that the average body mass index among people with binge eating disorder was 34.1, in the obese range. People with binge eating disorder had a considerably higher body mass index when compared to those without the disorder; however; obese individuals without binge eating disorder were found to be psychologically similar to normal weight individuals without the disorder, which indicates that binge eating disorder is a separate condition from obesity 3. While binge eating disorder can increase the risk of obesity, not all individuals with obesity display the psychopathology associated with this condition. According to the Diagnostic and Statistical Manual of Mental Disorders binge eating disorder is characterized by episodes during which a person eats significantly more than the typical person would eat during a given time period. During these episodes, the person feels as if he or she cannot control the amount of food consumed; the episodes also involve conditions including eating more quickly than normal, concealing the amount of food consumed because of embarrassment, and feeling ashamed or depressed after eating. Binge eating disorder involves not only consuming an excessive amount of food, but also the experience of feelings of depression and shame linked to the overeating. To meet full criteria for binge eating disorder, a person must demonstrate apparent distress regarding the binge eating and engage in episodes of binge eating at least once per week for a period of three months. Occasional episodes of overeating do not constitute binge eating disorder, as the Diagnostic and Statistical Manual of Mental Disorders specifies that the bingeing must occur at least once per week for an individual to meet diagnostic criteria. The binge eating episodes cannot regularly involve compensatory actions, such as exercising to burn excess calories, as is seen with bulimia nervosa. Binge eating disorder is a distinct condition that is separate from anorexia and bulimia, but may share some characteristics with these disorders. In 2000, researchers from San Diego State University, Yale University, Brown University, and Oxford University conducted research that compared individuals with binge eating disorder to those with anorexia and bulimia as well as control groups. The study’s results, published in the International Journal of Eating Disorders, found that participants with binge eating disorder scored similarly on the Eating Disorders Examination to patients with anorexia and bulimia. Specifically, patients with binge eating disorder were preoccupied with weight and body shape, and they found both weight and body shape to be a critical part of their self-evaluation. Furthermore, patients with binge eating disorder displayed more psychopathology related to disordered eating when compared to overweight individuals who served in the control group5. Much like anorexia and bulimia, binge eating disorder involves psychopathology and is accurately classified as a mental disorder. However, it differs from bulimia, as it does not involve compensatory behaviors, such as purging or exercising excessively to burn calories, and it is distinct from anorexia, which involves restrictive eating behaviors and a low body weight, according to the Diagnostic and Statistical Manual of Mental Disorders. Patients who had a mental health diagnosis at the time of the study also demonstrated lowers levels of self-esteem and greater eating disorder pathology7. Binge eating disorder appears to have a strong link to other psychiatric conditions. 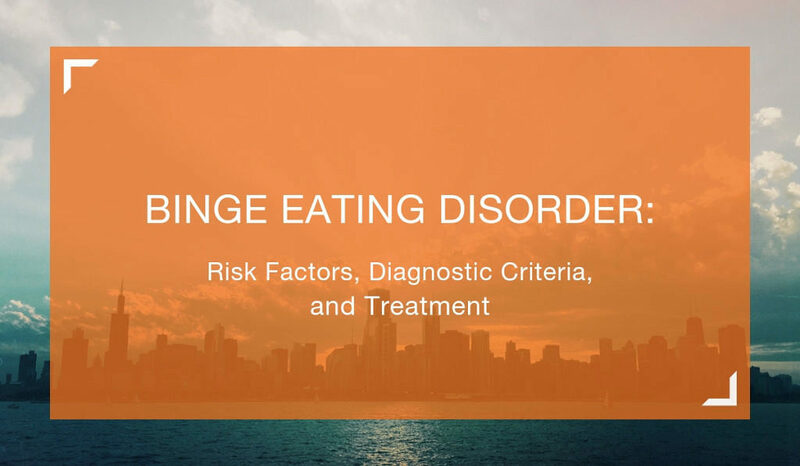 Individuals with binge eating disorder are likely to experience comorbid mental and physical health conditions, and there are certain risk factors that can increase a person’s chance of developing binge eating disorder. Additional research has explored the risk factors for binge eating disorder, comparing these risk factors to those associated with other eating disorders, including anorexia and bulimia. The study, published in 2017 in the Journal of Abnormal Psychology, evaluated risk factors for eating disorders among a group of young women who were not satisfied with their bodies. Individuals who were naturally lean were more likely to develop anorexia nervosa throughout the course of the study9. These results suggest that binge eating disorder shares risk factors with bulimia and purging disorder but may have different risk factors when compared to anorexia. In 2017, scientists from the Department of Medical Epidemiology and Biostatistics in Stockholm, Sweden, and the University of North Carolina Chapel Hill evaluated the results of nearly 30 studies that assessed the effectiveness of various treatment options for binge eating disorder. These scientists discovered that a stimulant medication called lisdexamfetamine was superior to antidepressants for preventing binge eating. The study also found that cognitive behavioral therapy was more effective than behavioral weight loss programs for decreasing the occurrence of binge eating episodes10. Treatment is important for people suffering from binge eating disorder. Medical and mental health professionals should be provided with training, so they are prepared to identify people who are at risk for this condition, as well as those suffering from it, in order to make referrals to appropriate resources or treatment providers. As research has shown, binge eating disorder is even more common than bulimia nervosa, making it a relatively prevalent eating disorder and a threat to public health. Individuals who are diagnosed with binge eating disorder are likely to experience other physical and mental health conditions, including diabetes, sleep disorders, and mood and anxiety disorders. While binge eating disorder is associated with obesity, the emotional and metal aspects separates individuals with binge eating disorder from obese individuals without the disorder. It is therefore important that patients struggling with binge eating disorder receive quality treatment so they can achieve optimal functioning and restore their health and wellness. Treatment can be effective and can result in positive changes.